Fall is one of the best times of the year. The kids are back in school, the summer heat is gone and the holidays are just around the corner. The natural colors that come with fall provide a stunning background for your fall and Thanksgiving decorating. One of the best things about decorating for the fall and Thanksgiving is the abundance of craft and decorating items that can be all around you, including in your own yard. You can easily make amazing decorations to blend with your home decor from stuff that is easily found around your house or at your local dollar store. 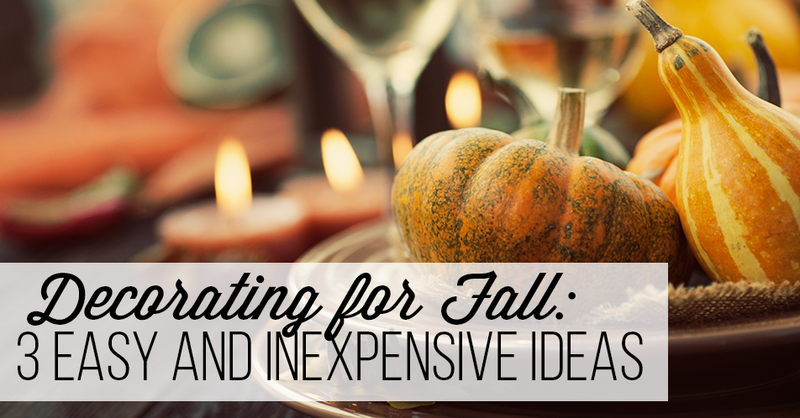 Here are three ideas to help you get started with your fall decorating. Using adhesive vinyl, cut out shapes of a maple leaf, pumpkins or any other fall inspired motif (one per jar). Apply the cutout shape to the jar and paint the remainder of the jar with your favorite fall color. Remove the vinyl after the paint has dried completely. Tie a piece of twine or ribbon around the rim of the jar. Place a tea light candle in each jar. Glue the linen napkin to the foam core and place in the frame (without glass). Cut out your message, such as “Welcome” or “Happy Thanksgiving.” Attach the message to the napkin. Cut out various fall inspired shapes, such as leaves or pumpkins. Place the shapes in a decorative bowl, include push pens in a separate bowl and place next to a pen or marker. Don’t forget to “pin” your thankful message to the welcome board. Create a stunning, colorful candle centerpiece by using leaves found in your backyard and inexpensive candles. To make this quick and colorful centerpiece, simply adhere leaves to the candle, tie a piece of twine around the middle of the candle and group three candles of different heights together on top of a small piece of burlap. Fall is the perfect time to showcase your creativity while decorating for the fall and Thanksgiving on a tight budget. Nature has provided you with a wide range of colorful, free and inspiring items that can be used for one-of-a-kind decor. The weather is great, so go ahead, take a walk and enjoy the fresh air and you can gather your decorating supplies at the same time. If you are ready to add to or replace your worn furniture before the holidays arrive, visit us at Wickmans Furniture! We’ve got that piece of furniture you have been wanting.